Joining the Army was not only patriotic, it was an escape from home. He was shipped to the Pacific where his unit was assigned and to a campaign with Australians that officially never took place. Generalissimo and Viceroy of the Philippines Douglas MacArthur had agreed to deploy secretly to New Guinea a contingent of US Forces to assist the Australians in obstructing the Empire of Japan from staging an invasion of Australia from New Guinea’s southern coast. There the unit to which Douglas Valentine Sr. was assigned was sent and there is where MacArthur forgot about them. Lying about his age to do his patriotic duty: does the lie or the duty or the patriotism come first in the Boy Scout law?1 especially when one has reached the pinnacle of the paramilitary organisation Baden-Powell launched in support of British imperialism during the Boer War. After three years of imprisonment, this Eagle Scout came back to the US physically broken and denied every recognition, benefits or assistance due to veterans of US wars. What is worse he had to give his consent to this denial, obstructing later recourse. Naturally the actions of MacArthur, Patton and Eisenhower toward the WWI veterans of the “Bonus Army” could have shown what the ordinary private soldier has to expect when in need after having served his country. However, the machine for selling the military and war has always been rather successful at masking the real divisions between those who command and those who die. Even today it is the supposed military virtue attributed to these generals, their supposed loyalty and concern for their troops, their supposed (imagined) bravery at the head of enormous bureaucratic organisations which is allowed to overshadow their actual conduct as officers in the military class and caste system. Another remarkable quality of The Hotel Tacloban is that it goes beyond mere transcription. After years of abysmal health, Douglas’ father had to recount events which, by his own standards, filled him with shame. 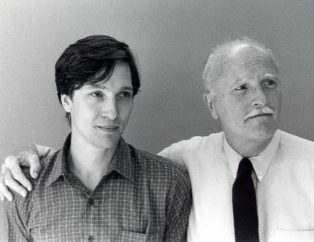 The story he told his son could not be uplifting or evidence that indeed the father’s conservative ideals had triumphed or were in any way worthy of emulation. Of course, some of the feelings burdening the principal in the story cannot be attributed to ideology or personal opinion but must be seen in the overall trauma of war. Where soldiers are taught to obey, kill or die, the failure to die while comrades are killed or the inability to kill when ordered to do so or even to kill when there have been no orders but necessity is worse than original sin. One can cease to believe in God, but the military remains and with it all the capacity to punish those who violate its codes of conduct. The book that resulted is a small effort to transcend that closed immoral world and the control it exercises over the souls of those who have spent any serious amount of time in it. It is not a story of familial or generational reconciliation but a partial purging of the military parasite that, like the malaria parasite, had destroyed the youth and most of the adult life of Douglas Valentine Sr. 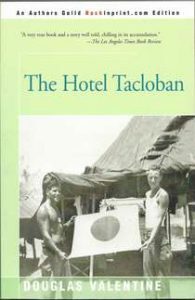 The Hotel Tacloban is a short book, 173 pages comprising nineteen chapters. In the beginning the background to the deployment that brought the 16-year-old to New Guinea is told. Intermittently the exploits of the big Douglas, the great self-promoting warrior chieftain and third generation mass murderer in the commission of the United States, MacArthur are summarised for context.3 This serves to remind the reader of the difference between the war story for public consumption and the war stories that are suppressed because they neither flatter the mass murdering class nor make good advertising for cannon fodder. At the same time it is important to see that Douglas Valentine Sr.’s suffering is a direct result of the uncontrollable egotism, class and caste arrogance, and blood lust of the Big Mac, who was fond of posing as a soldier’s soldier but, in fact, considered any and all servicemen who did not immediately benefit his career to be worthless. Douglas MacArthur was probably the most theatrical of the mass murdering class in his day and so it might be unfair to make him a bigger, easier target than he already was. Eisenhower liked to keep a low profile; letting generals like Patton “play Macbeth”. From a stylistic point of view it is highly appropriate to focus on MacArthur also because of the coincidence of their first names. The story is an investigation in the depravity of war, not only for those upon whom it is waged but also for those who are just there to obey, kill and die. It is also something like what the Germans call a Bildungsroman, a novel in which the protagonist is educated and developed into the character central to the narrative. At the same time this book has the brilliance of Herman Melville’s Billy Budd.4 Douglas Valentine Sr. is not executed like Melville’s hero but the story is full of the contradictions of class and caste in the military (the only place in American society where both class and caste are even acknowledged). Beginning with Valentine’s landing in New Guinea and the patrol in which all but him are brutally killed, the story includes details that suggest explanations for events but remain riddles unsolved. For instance, before going out on patrol the lieutenant leading the squad orders Valentine to remove a military patch displaying crossed swords (perhaps a cavalry badge) from his uniform. Grudgingly he assents but apparently forgets to actually do it. When the squad is ambushed, every soldier is brutally bayonetted until the Japanese come to him. The Japanese officer commanding appears to recognise the crossed sword patch and Douglas’ life is spared. Yet the story offers no explanation for this anywhere, leaving the attentive reader to wonder what the significance of this trivial detail has, if any. To arrive at the prison camp, the young Douglas Sr. has to be transferred by ship from New Guinea to Leyte and is blindfolded the entire route. Here again we notice that a fact becomes a narrative device because the capture and transfer were alienating but the reader has to understand how alienation occurs in the person who experiences it. This use of detail to construct preponderance in a situation has become a characteristic of Douglas Valentine’s work. Although there is nothing sinister in the transfer itself, the stages of entering the hell that Valentine Sr. would inhabit for three years are just as important because the violence of war is not accidental activity. It is planned and depends on a myriad of ordinary operations which, if viewed in isolation, conceal the concept of mass murder to which these acts also belong. I suppose it’s a cultural foible with the English (certainly any nation that nurtures and glorifies a royal family, at huge public expense, necessarily develops an unnatural devotion to figures of authority), but it was embarrassing to watch the Brits grovel at the Major’s feet. For their part the Aussies looked down upon the Brits with disgust and wondered how any self-respecting man, especially a soldier, could allow himself to accept such a demeaning, subservient role. No Aussie in his right mind would ever play the toy soldier, or yield to someone regardless of his merits. Aussies rendered their loyalty to individuals of proven worth, not to abstracts like office or rank. Of course, what also separated the British from the Australians (and Valentine) was the fact that most of the British were professional soldiers—the Army was their business. The Australians were serving because Japan—at least New Guinea—was on their doorstep. When the war was over the Australians would return to Civvy Street.7 The sergeant major, those company grade officers and NCOs had to play by the rules—the rules of the mass murdering elite who control the professional armed forces. They could not afford Australian libertarianism—even had it occurred to them. At this point it is important to note that although war is essentially a lawless condition—organised murder and destruction, in which the criminals who run the State authorise those they rule to commit virtually unlimited violence against chosen targets with whatever state of the art weaponry prevails—there has been a tradition in most societies that regulate even the limits of this authorised murder—if only to keep the organised hordes from turning on their leaders or interfering with the State’s objectives by mere wanton violence. This lawlessness is governed by what are generally called the “laws of war”. In ancient times; i.e., before industrial mass slaughter (middle of 19th century), these mainly unwritten rules were based on the sentimentality of chivalry. Knights were supposed to be subject to codes of conduct including respect for the unarmed or those who surrender in battle. However, with the abeyance of “knightly combat” new instruments were developed. In fact, the chivalric codes for war only applied to combatants of equal rank and station and never extended protection to foot soldiers of the rank and file. This was initially only a national solution intended to dampen public disgust at the British Army’s mismanagement of the war. Eventually this model was extended to cover most countries for whom professional trans-border murder and mayhem were standard. (Needless to say little aid was afforded those in the colonies or wherever non-whites were resisting conquest by force of arms.) The exceptional slaughter among white folks in the years 1914 – 1917 served to reinforce arguments for rules to govern the conduct of mass murder by uniformed servants of the State. Today we still have The Hague and Geneva Conventions9 governing the conduct of war and the treatment of prisoners of war. As a result the laws of war codified the practices of class (and race) distinctions too. In a POW camp it is generally prohibited to assign officers to manual labour. Officers are to be accorded the courtesies and privileges due to their rank even in captivity—within the scope of the camp’s resources. US soldiers remain subject to military law (UCMJ – Uniform Code of Military Justice) while in captivity.10 De facto they also remain subject to every kind of brutality and chicanery that the military hierarchy has ever invented for the subordination of the ordinary soldier. One could argue even more so than in combat. The officer in prison is no longer able to simply order his subordinates into battle from which he can expect they will not return—a common practice during the so-called Great War. He is leader in a defeated unit. The imputed bravery which is the officer’s ritual claim to authority not only cannot be exercised, it can be seriously questioned as having been inadequate to prevent captivity in the first place. For these reasons it is all the more urgent that officers maintain those class and caste distinctions of rank since they have been deprived of any other sort of legitimation and by their own subordination to the enemy also their freedom to arbitrarily dispose of unpleasant members of the lower ranks. Although The Hotel Tacloban is not written as an allegory or even a history of British intra-imperial relations, it is easy to surmise that the antagonism between the British, with Cumyns at the apex, and the Australians, led by Lieutenant Duffy, has its own history pre-dating the camp. Ordinary Australian military history records the anger of many soldiers who fought in the First World War and died gratuitously under British command.11 The ethnic composition of Australia—leaving aside other immigration—included not just those stigmatised by penal servitude and transportation for “crimes” but also the components of the British population which the English upper classes (and before them their Norman forebears) had been taught to despise—esp. Scots and Irish. Douglas Sr. was dumped into this pot of dysentery-inducing gruel for three years. And when it all seemed over, when the US Army collected him from the camp after Leyte had been returned to MacArthur’s control, the next round began. His very existence became an indictment, but of a crime he could not imagine. Here The Hotel Tacloban may remind the reader of Caleb Williams.12 The eponymous hero of William Godwin’s novel is accused of a crime by the principal landowner on whose estate he works. Not only is the charge unfounded but also the machinery by which he is to be tried and judged is so blatantly corrupt that he cannot be acquitted. Having been decreed a criminal his subsequent life becomes one endless flight from treachery to treachery, to the point where the reader is forced to ask is there not one person, one instance capable of acknowledging the blatant injustice and that the perpetrator both of the supposed crime but of all the consequences is none other than the master of the estate from which Williams was forced to flee. Nowhere in the great hierarchy is there a hope of appeal. Godwin argued that there can be no appeal since the hierarchy cannot condemn itself. This article was posted on Monday, June 19th, 2017 at 8:15am and is filed under Australia, Book Review, Japan, Militarism, Philippines, United Kingdom, US Hypocrisy.